I want this at my school! The creative process visualized – Holy Kaw! Be sure to check out my post at the Nerdy Book Club blog today. I am so excited to have my first post up because the Nerdy Book Club is AWESOME. Seriously, awesome. I have been a card carrying member of the Nerdy Book Club pretty much since birth and I am ecstatic that I have a real tribe now. Be sure to check out the blog and the hashtag on Twitter if you haven’t already done so! 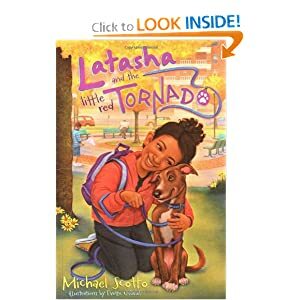 When Michael Scotto emailed me to ask if I would be interested in reading a review copy of his novel, Latasha and the Little Red Tornado, I wasn’t sure if it was for me. I try to focus on YA titles these days, because those are the books my students are reading. It takes a special middle grade book (especially if it’s on the younger end of the spectrum!) to get my attention. But Michael hooked me when he mentioned that one aspect of the plot dealt with the main character trying to train her puppy. Been there, done that! I figured it wouldn’t hurt to give the book a shot. When the book came, I placed it on my TBR pile which was taking over my life. I was in the middle of reading for the Cybils and didn’t have a lot of time to read anything else. I finally got a chance to read Latasha and the Little Red Tornado a few weeks ago and I loved it! Latasha is adorable. She is intelligent, well-meaning, and wants to be grown up more than anything in the world. Her best friend is her puppy, Ella Fitzgerald. But Latasha struggles to deal with her mother’s new job and the fact that her landlady is now her babysitter. Plus, Ella just won’t listen and the landlady is not a fan of disobedient dogs. So Ella decides she will train Ella to be the perfect tenant. This book is adorable! I can’t wait to pass it on to some of my younger cousins. Latasha is easy to like and easy to relate to. The dog training aspect of the story is well-done and realistic and you can’t help but love Ella. She is just so cute! But the plot is anything but predictable- brace yourself because you won’t see the ending coming! Highly recommended for middle grade readers, particularly in 4th/5th grade! evaluate those examples and to put them in the context of their readings on Swift. My colleagues and I are currently in the second year of my favorite “experiment”. Last year, inspired by Google’s 20% time, we decided to try a variation of the project with our freshman. I am extraordinarily lucky because my colleagues are fabulous and we teach an integrated curriculum (Biology, English, Software Applications, and World History). This means we control the schedule for all of the freshman every morning. We are able to divide the time up between our classes in whatever manner works best and we do cross-curricular projects as often as possible. So we decided we wanted to try our own version of Google’s 20% Project, which encourages Google employees to spend one day per week working on a project of their own design. While we can’t devote one day every week to our experiment, we ended up with Free Form Friday. Free Form Friday is an experiment- last year we had no idea how it would turn out when we turned the kids loose and we were thrilled with the results. This year we made a few adjustments and sent the kids off to work. I’m so excited about the projects they have come up with and can’t wait to see the end results. Introducing the project to the kids was a lot of fun. We told them that we would be giving them the option to work on a project of their choosing for the next two marking periods. There would be no rubric and no guidelines other than their project had to bring together Biology, English, Social Studies, and Technology. This always got the whispers going. As we continued, the hands would go up and the volume would rise. Our students are not used to working without limits or rules and this project is scary for many of them. 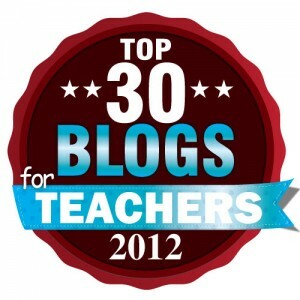 Before we answered any of their questions, we shared out fears and what we, as teachers, were excited about. And then we gave them a period to brainstorm individually. This is important, because we want each student working on something that they are passionate about, so they can’t make groups until they know what they want to focus on for the duration of the project. This is a very difficult step for many of my freshman. They want to be with their friends, and how can they ensure that happens if they can’t talk to each other during the brainstorming period! But we provided notebooks and computers and set them loose. They had until the next week to post their ideas on our wiki and “pitch” to the rest of their class. This way, students with similar ideas would have the opportunity to try to work together and other students would have the option to work alone or in pairs if they preferred that. As of today, all of the students have projects and are working. We try to have a Free Form Friday every other week, devoting 140 minutes on Friday morning to the project work. The students have access to laptops and a computer lab, along with various classrooms and our MPR. But the best part is the work going on outside of class. Some freshman boys approached a group of juniors who are taking a programming class and asked them to teach them the programming they need for their idea. Other students are emailing experts in their field of study and networking with scientists/professors. We have students designing webpages and blogs, Google surveys and data analysis. It’s amazing! The students are working on some amazing projects, too. We have everything from parkour to lucid dreaming. One pair is studying modern censorship and a scientific study that showed people who read fiction are more emphathetic than those who do not. Last year a group of girls produced an amazing documentary and website about the culture of beauty – they even interviewed employees at various stores in a local mall about the hiring process. Afterwards, they interviewed managers at those same stores and learned that the “party line” is not the same as reality in most cases. What an eye opener for them and their classmates! I can not recommend 20% Time projects enough. The students are incredibly engaged and the connections they are making across the curriculum are pretty mind-blowing. And personally, I love that they are working without a rubric. It’s very difficult for some of the more grade-oriented students, but it’s such a valuable experience. They also know that at the end of the project they will be deciding how we (the teachers) will assess them. The grading criteria will be designed by each group for their specific project. I love this, because it means they get the chance to think critically about their own work, rather than relying on a third-party. They are responsible for keeping us abreast of their progress after each Free Form Friday. By the end of the 140 minutes they have to file an update that explains what they accomplished that day and what they plan to accomplish for next time. It keeps everyone accountable without inundating them with extra work. They file the reports in a class binder, according to group, which allows us to access them while also allowing the students to go back and look at the evolution of their project from start to finish. Free Form Friday is one of the best parts of the year for me and I can’t wait to see the final projects that this year’s group comes up with! Are some of our students confused about the project? Of course. But many of them are also excited. And slowly, that excitement is spreading. We have students talking about their projects outside of class time. They are divvying up work and going above and beyond our “requirements”. Some of them started planning back in September, after they got wind of the project via the sophomores. Talk about engaged learners! And even those who are confused can see the value of the project; we have many alum who work or have worked at Google and it’s a job many of our students aspire to. Do you do anything similar to a FedEx Day or Google’s 20% time in your class? I’d love to hear about it!